​Will I receive my hiking backpack at the end of my flight? Will I get it in one piece? Will it pass through the ordeals of security check? What forbidden items, according to the airport’s security regulations, have I unknowingly packed inside my checked in hiking backpack? ​Based on my (and the experiences of other unfortunate travelers'), I've gathered some pointers about how to check your hiking backpack and your gear (separating them could be a good idea in some cases) on a plane in order for them to go as smooth and incident free as possible. Know what hiking gear you can & can't bring on an airplane. Don't forget to protect the pack on the inside! We aren't going to discuss the likelihood of getting your hiking backpack accepted as a checked baggage or not since that's always down to (1) weight limits of your airlines (there are no regulations that apply to all airlines) and (2) the airline staff. Weighing your pack is the only precaution you can and should take. The first advice I always give is, although seems somewhat counter intuitive given the topic, to avoid checking a hiking backpack whenever possible. If you can bring it as a carry-on, do it. They keep telling you through the speakers: “Keep your luggage in your presence at all times”. At all times! But seriously, the sad fact is that luggages do get lost when travelling by plane. No matter if it gets lost for good or you eventually retrieve it (like I did in my unfortunate case) - the hard-planned trip is pretty much ruined unless you have the mindset of a monk. Some airlines are more lax when it comes to the size of your luggage, some are more rigid, while others change their regulations every couple of months. So there are no regulations. As a maximum carry-on size, most airlines draw the line at 22x14x9. Read more about it here in best carry-on backpacks review. Knowing their specifications beforehand is a must if you'll go down this road. You don’t want to be “that guy” in front of the check-in desk that goes on the roller-coaster of emotions of removing items from his overweight or overstuffed luggage, placing it on the scale, removing it again, putting on another pair of jeans and perhaps one or two sweaters, placing it on the scale once more, only to hear that still no go. Sure there are different situations you can’t avoid packing big. Or certain items you can’t dispense of and can’t really carry with you on the plane (e.g sharp tipped trekking sticks). You could try sending your gear up ahead, using express shipping. Perhaps doesn’t completely solve your “gear getting lost” issue, but somewhat reduces it, as you actually have more control over the cargo’s whereabouts. Thinking of investing in a travel insurance can be a good idea as well. However, you should pay attention to its coverage span as most travel insurances cover loss items up to a very limited level according to Vovidi. But if you still have to check it in at the airport, keep reading and take a look over the next couple of lines. As you know, unlike carry-on baggage; weight is more important than size when it comes to checked baggage. ​If you’ve found yourself in the pickle described above or if you travel quite often and still find yourself paying the extra-fee for overweight baggage, perhaps save up some of that money and embarrassment by investing in a luggage scale such as Tarriss Jetsetter Digital Luggage Scale w/100 lb capacity | $12.97. Note that although your luggage scale has nearly 0.2 lb of accuracy, while the airport’s are not that precise. So, perhaps leave some margin of error around that idea. If you’ve planned with great care and thought about all the ways that you could pack light, that means you packed only the “can’t do without” items. But what if your luggage still exceeds the max accepted weight, how do you choose which of those essential items you dispose of? First option is leaving out the items you'd prefer purchasing newer ones at your destination. Second is wearing the heaviest items during your flight. This can make a huge difference if you're heading to a cold destination so you've a lot of heavy clothing to take with you. This is a must not only because the airport & airline staff aren't gentle to luggages and packs at all, but also conveyor belts can do a lot of damage to your pack (especially to straps, belts, zippers and buckles). Carefully protect your backpack’s straps, tie them together, cover them at any cost, and make them less of a target. For example, you can pull the waist strap backwards and buckle it around the backpack, on the other side of it. Another tip I find useful is tying the two separate shoulder straps together and hence providing the luggage handlers one sturdier strap to grab, protecting your straps in the process. Some other packs like Farpoint 40 provide stow-away harness, which is a great feature to have in this case. This one is a travel backpack with a lean towards hiking backpack, though. Which is why this feature isn't offered by most high quality hiking backpacks. Secure the zippers the best you can as well. Most backpacks have that small, extra fabric material along the zipper’s line that you can use to hide the zipper underneath. We take zippers for granted that we easily forget their importance. Until your items start falling from your broken external zippered pocket, you don't realize their value. If you prefer always being prepared beforehand for these type of failures, you can also think of investing in Zipper Rescue Repair Kit | $10.99 before your trip just in case. Coming down to another small, overlooked piece of equipment: Buckles. They're also exposed, and having them damaged would affect the hip belt and external compression straps of your pack. Like zippers, you can think of investing a pair of buckles Sea to Summit Field Repair Buckle | from $4.50 before your trip just in case. My best recommendation, however, would be the hiking backpack airport covers. They basically cover your pack (duh) and hence you can stop worrying about arriving to the airport even earlier to wrap it or taking precautions above to protect it. Plus, you actually own an item instead of paying for a service each time you'll travel with your hiking backpack. Osprey's Transporter LZ Backpack Cover also has a top carry handle. You can basically go for anything you'd like, but besides durability and firmness; packability into its own carry case is important because you'll be traveling with one more item now. Another thing I'd pay attention to is adjustable shoulder strap(s) as you walk A LOT in the airport even though you don't really notice it at times. 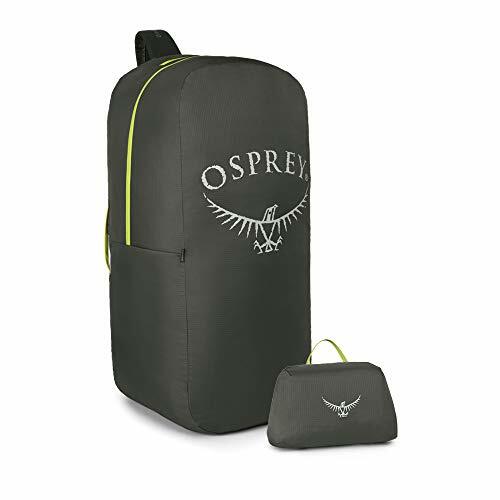 Osprey's Transporter LZ Backpack Covers offer both of these features (Plus: Stow away shoulder strap) with a few nice to haves such as lockable zippers and ID card holder (although I never use these stuff). To protect your pack, base is reinforced and fills the bill. Most popular thing about it is its All Mighty Guarantee, though. I'd definitely check it out when looking for a hiking backpack airport cover. Cover the sharp items inside your pack with clothes or other soft fabric, so they don’t rip through the backpack. Again, sharp tipped trekking poles are a good example. According to TSA, you can't take your trekking poles as carry on, but you can take them as checked baggage. ​Same goes for hard items or objects with non-rounded edges. Surround them in clothing doesn't only protect your pack from them, but also protect them from the harsh conditions your pack is exposed to during the loading/unloading to and from the plane. Also, knowing how to pack a hiking backpack for traveling and/or backpacking is crucial for this step. Hiking or not, whenever you’re traveling, mark your backpack/luggage, so that you don’t grab the wrong one and/or, someone else accidentally grab yours especially if you’re using the wrapping tip and/or you have a common looking pack with a typical color. If you're worried about your valuables stolen and would rather invest in an anti-theft backpack, check out the review of the best anti theft travel backpack out there. You can basically mark with anything you want. I just tie a cord with an easily distinguished color. Read the allowed and forbidden items lits by TSA specifically for backpackers very carefully, as it holds out traps for the uninitiated. For instance, camp stoves are allowed. Great. Easier cooking. But! Camp stoves fuel? Forbidden. So, propane based fuel, camping fuel, burning paste and gel fire starters are prohibited. One of the most intriguing tips I got, as to how to overcome this, was to replace any kind of fuel with vodka. Makes sense as you indeed can check-in vodka, if in its original, proper sealed wrapping. For extra security measures, you can use a special travel pouch to protect the bottle and seal it in the event of leaks. Plus, if you aren't a serious hiker it makes a great party starter, in addition to being a great fire starter! Animal repellents usually exceed limitations of active ingredient allowed on flight, even if it’s for the pack in the belly of the plane. Insecticides aren't allowed either. Insect repellents, however, you can have, taking into account the liquid limitations when in carry-on bags, of course. All of these tips came from the vast experience of people who underwent these situations (including myself) and found out the hard way that they had to come up with some ingenious ways to avoid such inconveniences from happening again. As Warren Buffett says, "It's good to learn from your mistakes. It's better to learn from other people's mistakes." Hope this article was helpful for you to understand the best practices of checking in a hiking backpack. Happy trails/travels!